CHANDLER, AZ (November 3, 2015) – A storm is brewing on America’s horizon, according to John Horvat II, author of Return to Order: From a Frenzied Economy to an Organic Christian Society—Where We’ve Been, How We Got Here, and Where We Need to Go. Horvat, one of America’s preeminent conservative thought leaders will delve into the center of that storm – the nation’s social and economic chaos – at a special event in Hockessin, Delaware this month. “The economy continues on its course of self-destruction as a result of ignoring our God-given moral compass, which ultimately keeps everything in balance,” according to Horvat. He will present Return to Order’s solutions on how to address the storm at 6:30p.m., on Saturday, Nov. 7, in Hockessin. The presentation will be held at St. Mary of the Assumption, which is located at 7200 Lancaster Pike; it is open to the public and there is no admission fee. Return to Order is in the hands of almost 70,000 readers on four continents, received dozens of endorsements, and has earned nine awards. Horvat’s messages, based on 20 years of research, have been heard by more than one million listeners through radio and television appearances as well as during more than 200 presentations around America and in Europe. Horvat is a prolific media contributor, writing hundreds of articles which have been published by major conservative websites such as The Blaze, American Thinker, American Spectator, Crisis, Spero News, CNS News and the Christian Post. Those who would like to attend the presentation in Hockessin are asked to send an email to ddswrite@verizon.net. Horvat’s appearance is presented by The Committee of Three. 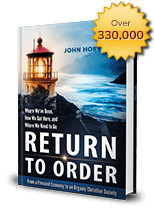 Return to Order is now available in hard copy format, as an electronic (Kindle) book and as an audio book on Amazon. For more information about the book, please visit www.ReturntoOrder.org Follow John Horvat on Twitter @ReturntoOrder. This entry was posted in Featured by RTO.org. Bookmark the permalink.